As one of Thailand's biggest and most popular islands, Phuket attracts visitors every year, many of whom plan to head straight for its exotic beaches. With an estimated 30 varied stretches of tropical sand and clear water, it can be hard to know which beach is going to provide you with that perfect day in the sun, be it reclining on a sun lounger, snorkelling amongst tropical fish, or zipping around the shallows on a jet ski. Well, look no further. We've compiled a list of the 7 best beaches on the island, each with their own selling points to ensure that everyone has their perfect beach day (or days) on this Thai island. Classic criteria have been covered to suit every traveller's preferences, proving that it's easy to plan a trip to Phuket regardless of your beach-bumming style. Good news! It's against the law in Thailand for beaches to be privately owned by hotels or beach clubs, so even if they have to be accessed through a private building, every beach is open for public use. Huzzah! From May to October, monsoon rains sweep over Phuket, making swimming pretty unpredictable and even dangerous in some parts of the island. Always check the safety flags on beaches before going for a dip, and if you're unsure, it's best not to brave it! If you're heading to Phuket for its famously bold and bustling culture, then Patong Beach is the one for you. This 3-kilometre-long stretch of sand is one of the most popular beaches in Phuket, and fronts the most renowned party centre of the island, Patong. The beach itself is just as beautiful as the smaller, more secluded spots on the island, with idyllic white sand, calm blue water, and swaying palm trees, however it has an energetic flair that makes it more about activities than aimless sunbathing. Water sports are one main attraction of the beach, with jet-skiing and parasailing widely available along the shore (unlike on many of Phuket's other beaches). However be warned, there has been a lot of media attention surrounding jet ski scamming involving vendors feigning damage and demanding large sums of money as compensation. So be really careful who you hire from, and take pictures of any clear damage that's already there before you use it. If you prefer to escape the tourist hot-spots it's also easy to get away from it all. Our top pick for the best secluded beach in Phuket says it all in the name: Freedom Beach - a small, 300-metre-long sweep of white sand that is pleasantly isolated for those desert island vibes. Located just around the bay from Patong, it's the ideal spot to escape from the buzz without going too far, making it perfectly positioned. You won't find any water sports happening here, and you'll have no vendors pestering you as you relax; there's just a few modest restaurants to keep you going throughout the day. Imagine nothing but the sounds of the waves, the chattering of happy travellers and locals, and the occasional gasp at how beautiful the beach is. While Phuket might not be the first place you'd think of for a quiet family holiday, there are actually some great beaches with child-friendly resorts scattered along the coast. 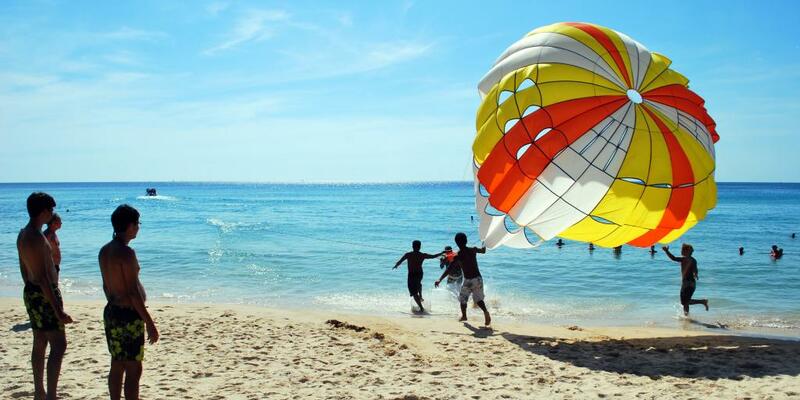 Karon Beach is a great example, easily suiting families with both younger and older children. 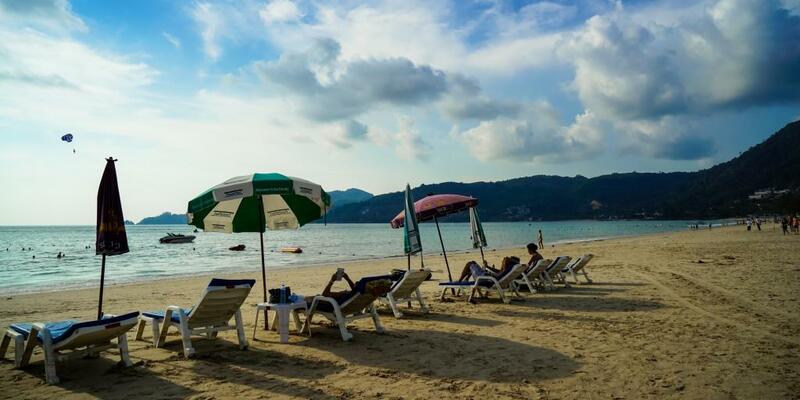 The beach is just as vast as Patong but without the bars and crazy nightlife, and has a great selection of activities available, including parasailing and massages. It's big enough that it's never too crowded for building sandcastles or running around, and there's a lifeguard on duty making it much safer to go in the water. Another bonus of Karon is that there are loads of hotels within easy reach of the beach, as well as a great selection of shops and restaurants nearby, so it's easy for the whole family to have a fun, stress-free day here. 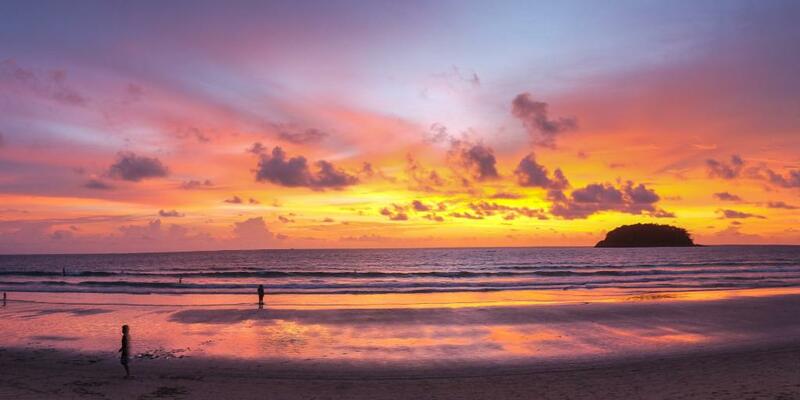 Okay, so it's pretty hard to pinpoint exactly what makes a beach perfect for spending a loved-up day with your partner, but for us it's all about the romantic sunset potential, and there's nowhere better in Phuket than Kata Beach. By day, this palm-lined bay has everything going for it, including plenty of space on the white sand, idyllic turquoise water, and plenty of shady trees for a romantic stroll. As the sun sets, however, it really comes into its own. The whole horizon lights up in a beautiful pink-orange hue, reflecting off the waves as they lap against the shore. If that isn't romantic, then what is? Watch the sunset from the beach, or book a table at Kata Rocks, a luxury hotel with an amazing bar and restaurant boasting one of Phuket's best sunset views - the ultimate place for a romantic dinner for two. 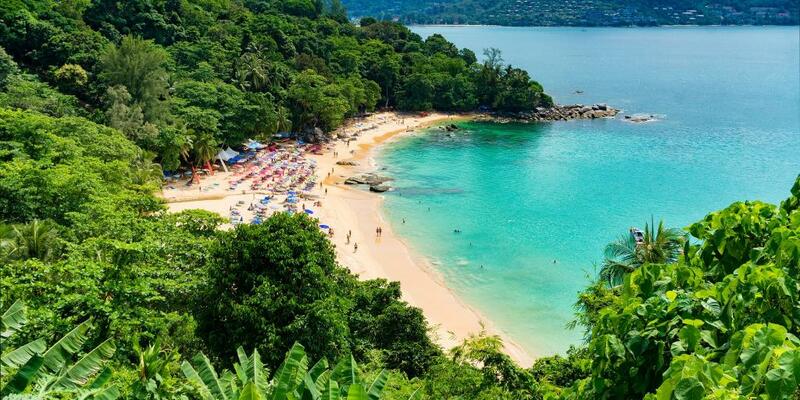 There are loads of spots in Phuket which are amazing for snorkelling, however Ao Sane Beach stands out from the crowd as it's safe for swimming all year round. This southwestern beach is only 200 metres long and has huge granite boulders sitting on the sand, making it a unique and memorable spot to visit on your trip to Phuket. Due to the fact that the beach has a slope down into the water, water sports are minimal here, so it's the ideal place for an undisturbed dip. Once you're in the water, there are two snorkelling areas: the first is a sharp drop off into deep water where you'll see loads of tropical parrot and clown fish, and the second is a beautiful area of coral reef to explore. Note: You'll have to wait until high tide to swim above the coral or else it will be too close to the surface. You'll need to bring your own snorkelling gear as it's not possible to hire equipment at this beach. Obviously every beach in Phuket is great for sunbathing, but Paradise Beach stands out for its amazing lounging facilities. Located in between Patong and Freedom beaches, access is via the Paradise Beach Clu, which is open from 9.30am until sunset. 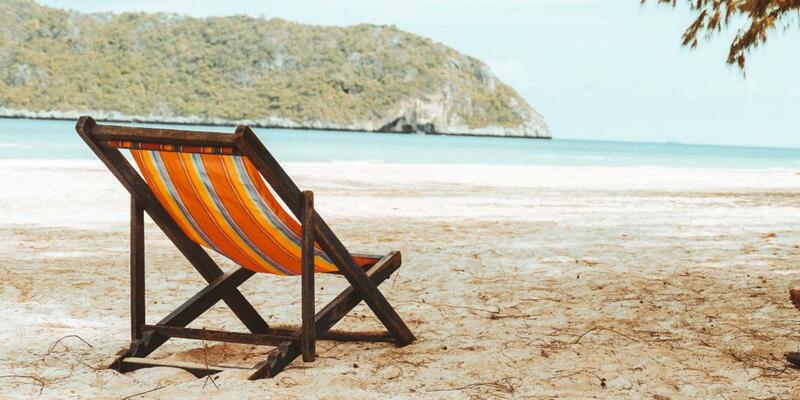 Although you have to pay a small fee, it's well worth it for sunbathers as you get a choice of cushions, sunbeds, and deck chairs which you can move around the beach as you please and use all day. There is also a line of shady trees for seeking refuge from the searing rays, and facilities and activities available through the club. By day, then, this beach is a quiet oasis for sun-seekers, but after dark it transforms into a lively nightclub, with famous parties going on throughout the night. So, if you - like many others - are in Phuket for the sunshine and the parties, then Paradise Beach is, well, paradise. 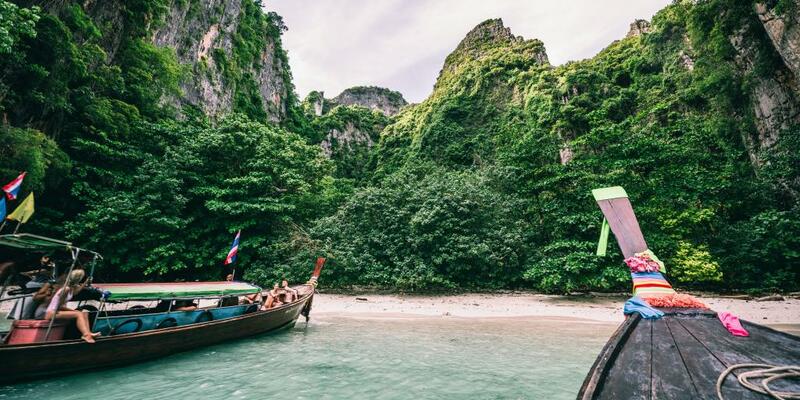 As amazing as Phuket's beaches are, it's always good to have a day trip up your sleeve for when you need a change of scenery, and what better place than the popular Phi Phi islands for some fresh beaches? The islands are around 40 kilometres from the pier in Phuket town, taking around 90 minutes on the ferry to Tonsai in the centre of Koh Phi Phi Don - the largest of the Phi Phi islands. Prices vary, with anything from 400 to 1,200 baht as standard depending on the time of day you travel and whether you've booked online in advance (do, it's usually a lot cheaper). You can also hire a private speed boat to get you there, which is much faster (and cooler) but more expensive. Koh Phi Phi is all about the beaches, so try and hit up a few while you're visiting. Maya Bay, the setting for the film The Beach starring Leonardo DiCaprio, was recently closed indefinitely after too many tourists caused some unfortunate environmental damage. Luckily, Maya isn't the only pretty slice of shoreline on the Koh Phi Phi islands. For some quiet downtime, head to Moo Dee Bay in the southeast. This secluded beach is fringed with an exotic coconut grove, and has a single beach shack selling food and drinks. 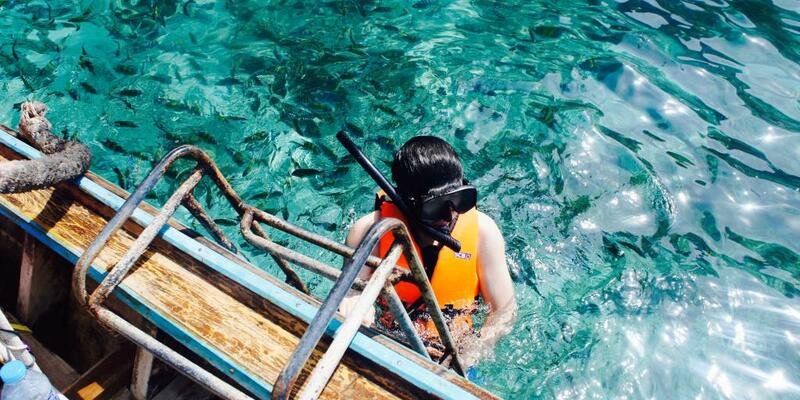 Access Moo Dee Bay via a ten minute boat ride from Tonsai Jetty. Another serene option is Phak Nam Bay, also known locally as Relax Beach. Here, charming little beach bungalows flank the shoreline, and chilled out beach-goers dangle from the hammocks that are strung up between palm trees. If you're after an idyllic Thai beach scene, this is pretty much as good as it gets. Although these two are great options, every beach in Koh Phi Phi is perfect for snorkelling, scuba diving, sunbathing, and all-round chilling; if you have a spare day in Phuket, definitely make some time for beach-hopping in the Phi Phi islands!